Storrer said the Wright claim is based on conjecture and guesswork. He said he believes if Wright had designed the building, there would be architectural plans of it somewhere. This has appeared before. If an argument is to be made in favor, there should be some more photos published. The one in this article argues strongly against FLW's involvement. If FLW and Blossom were involved in this cottage at all, I suspect FLW did a scheme, and Blossom built an entirely different house. For a building that early I wouldn't say that a lack of drawings is conclusive. We have none for Chauncey Williams, from the same year, yet nobody denies that it's Wright's. -- to me. The mis-matched horizontal siding may reflect alteration, as might the plain porch posts, which suggest later insect screening of the space. For a building that early I wouldn't say that a lack of drawings is conclusive. We have none for Chauncey Williams, from the same year, yet nobody denies that it's Wright's. ..... Does he have drawings for any of his alleged discoveries, such as that Dutch colonial in Racine? There is record in the form of drawings for Wright's revisions to the Chauncey Williams dormers, and Wright himself acknowledged his authorship by publishing photos of the house in 1911 (with revised dormers)and in 1942 (with original dormers). It is interesting that Wright published his revised version of Williams in 1911 and the unrevised version years later in 1942...I'm not sure if there is any connection with this to Cecil Corwin's death in 1941...it has been suggested that Corwin collaborated on Williams just before his departure from Chicago to New York. It further has been suggested that Wright may have worked on the Dutch Colonial in Racine (Mitchell) with Corwin as a collaboration, I suspect the drawings for it are in Cecil Corwin's archive, if it still exists somewhere, as it was primarily his commission. 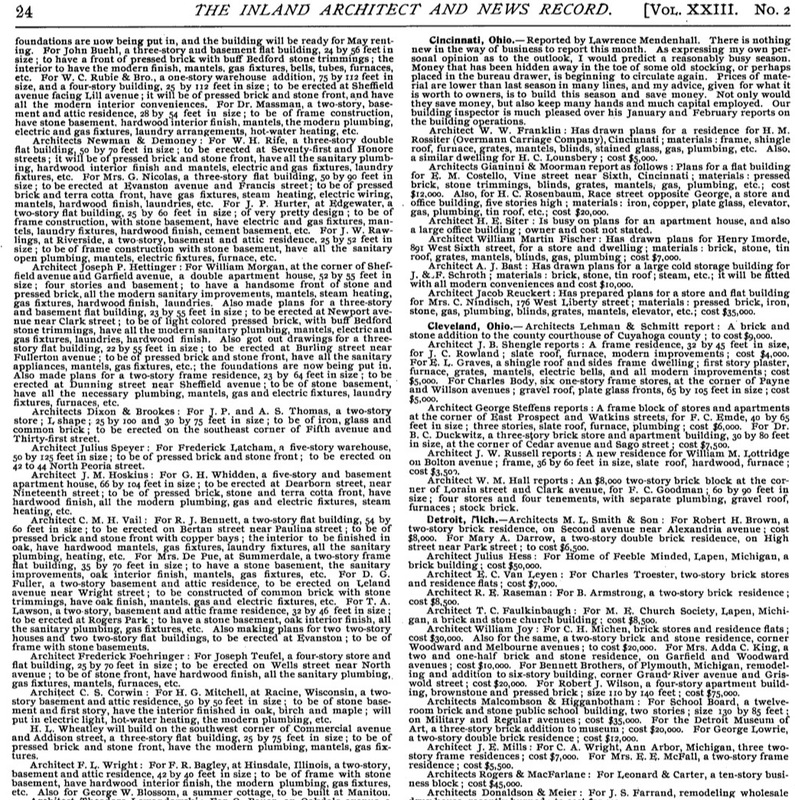 The article notes a March 1894 Inland Architect listing in which Wright is noted as the architect for the island cottage for Blossom as well as a city house (the article isn't clear if the city house was existing at the time of publication, we know it was)... the city house for Blossom was a "bootlegged" house done in 1892 under Cecil Corwin's name. Was Wright, now an independent practitioner, "setting the record straight", making it clear to the readers of Inland Architect that Blossom was a return client? Still we don't know what Wright designed or, as Roderick notes, if what Wright may have designed was actually built. It was my understanding the Inland Architect listings often announced projects in process prior to construction to allow contractors to call on architects to bid the work...this was not necessarily an announcement of a completed building. In any case, I'd like to see more photos of the cottage inside and out. I would caution reading into the current exterior column/siding configuration as I believe the columns are stock/almost home depot "porch" columns that were probably added by a recent owner. I agree, outside, those posts don't do a thing to convince one of FLW's involvement. A trip through rural Midwest farmland would reveal that they are very much like adornments on countless farmhouses. I like to think that somewhere between 1911 and 1941 FLW revisited Chauncey Williams, and regretted redesigning those dormers. The originals look so much better than the "witches hat" style. evidently the columns have been there for quite awhile! Broadly it resembles the Charnley cottage in Mississippi, although, as others have mentioned, this was a fairly common type. John's first photo shows the added siding to the open porch; the black-and-white photo lacks that and the "screen framing" -- and the stone infill imitating a foundation under the porch ? Stafford Norris III supplies the page from Inland Architect. See lower left corner. Stafford says nothing important is missing. 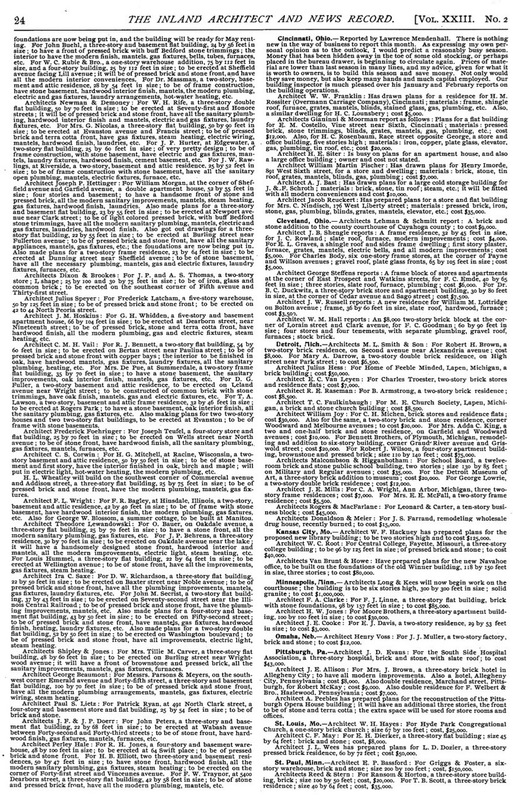 Stafford provides the complete page. He was right: nothing important was missing from the truncated page -- which appears at larger size, above. Many thanks for sharing this Stafford! Great to see the original source. Notice the particulars of the proposed construction of Mitchell and Bagley are listed but no mention of the particulars of the cottage...as if the commission had just been obtained but no design work had begun? Did it ever? 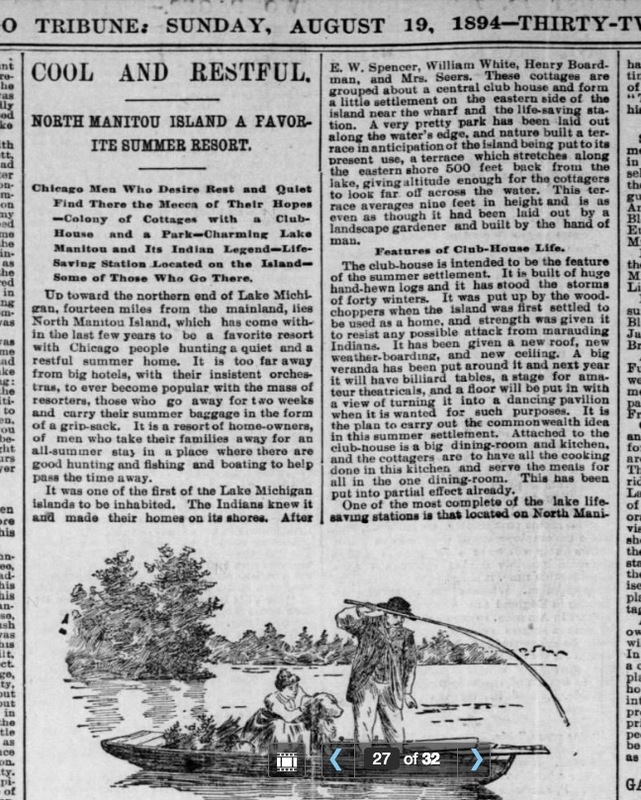 Stafford delves further, and uncovers this piece from a Chicago Tribune of 1894. "A summer colony grew on the east side of the island starting in the late 19th century. A group of successful Chicago businessmen built cottages (some of which remain on "Cottage Row"). The National Park Service occupies the old US Life-Saving Station (later, of course, the US Coast Guard) grounds near where the Leland boat lands campers. At the south end of the island was a lighthouse, built in 1896, automated in 1932, discontinued in 1938 and destroyed in 1942." 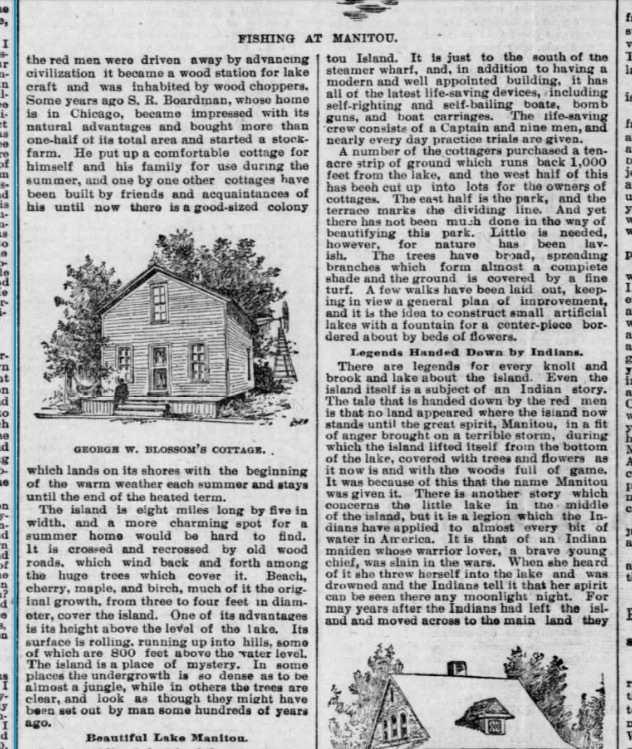 Per the August 19, 1894 Chicago Tribune article, the George W. Blossom's were receiving guests in their summer home "Beechwood", five months after the "to be built" listing in Inland Architect. 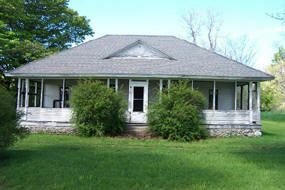 Was this really sufficient time to bid and construct a cottage on an island 5 miles off the mainland of Michigan near Traverse City? 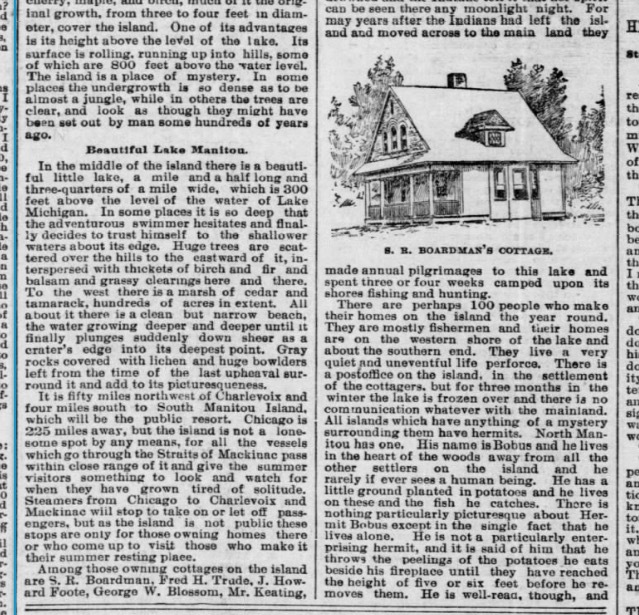 Or, did the George W. Blossom's already have a cottage, or did they buy, or rent, an existing cottage in 1894? The Blossom's house was called "Beechwood"...might there be any record of a house by that name in the island's history?